"New expansion joint hardware" didn't make any holiday wish lists this year, but I-5 is still going to get one due to the fact an old one broke in October. This emergency replacement requires two weekends of lane reductions on northbound I-5 at the Duwamish River Bridge. Contractor crews working for WSDOT will spend the first weekend – Jan. 5-6 - replacing metal on half the joint, then transfer to the other half during the second weekend closure, likely in February. This allows us to keep two lanes of northbound I-5 open while critical work is still being done. With State Route 99 closing for three weeks starting the night of Friday, Jan. 11, we need to be sure I-5 is in the best condition possible so it can handle all the extra traffic. Contractor crews working for the Washington State Department of Transportation replaced this joint in May 2017. They used steel pieces from the old joint, which at the time, were thought to still have some useful life left. Flash forward to October 2018, when part of the metal broke and had to be removed. This permanent fix will keep the joint in good working order for many years. Be prepared for the drive on I-5 north through Tukwila to take longer than usual during the two weekends of lane reductions. The first weekend begins at 8 p.m. Friday, Jan. 4 and will end by 5 a.m. Monday, Jan. 7. Our website will have closure updates. Sign up for weekly email updates on King County projects. Our Twitter account will have info about traffic. Download our mobile app for traffic maps and other news and updates. We know there's no good time to limit lanes on I-5. As soon as we have the dates for the second closure in February, we will update the links mentioned above. We thank you in advance for any adjustments you make to help us complete this important repair. I saw the sign, and it said "FREE"
When drivers enter the I-405 express toll lanes or the SR 167 HOT lanes in early January, they'll notice a slight change: the toll rate signs will say "FREE" instead of "OPEN" when we are not charging tolls. We recently took a fresh look at the signs and realized there was an opportunity for improvement. So we asked I-405 and SR 167 drivers and heard that almost 90 percent of people agreed that "FREE" made more sense. When the express toll lanes are operating during their normal hours, drivers still may see "OPEN" displayed on the signs. If a collision or roadwork blocks all lanes except the express toll lanes, we stop collecting tolls and allow all vehicles to use the lanes for free. Signs say "OPEN TO ALL" at these times. If you've never used the lanes before, or if you need a refresher, check out our guides. We have resources for drivers who use the express toll lanes and the HOT lanes. Changes to the new SR 520 Trail? You decide! Wednesday, Dec. 27 at 8:40 a.m.
We've tied green ribbon on the railing adjacent to the new plate to make it stand out. A sign has been added, and “test” has been spray-painted on the new plate as well. Thank you for your continued feedback! So far we've heard from more than 220 of you who want us to replace the existing plates, and less than 10 who say you see no difference/the old plates are fine. State Route 520's new trail across Lake Washington has garnered high praise from more than 300,000 users since its December 2017 opening. Bike riders, runners, dog walkers and folks out for a relaxing stroll tell us they're delighted to have a new, foot-powered trail with scenic lake and mountain views. And many pedal-pushing commuters say the new trail, as an alternative to I-90's cross-lake connection, is cutting significant time off their daily treks between the Eastside and Seattle. There's one aspect of the path that's not getting rave reviews: the narrow steel plates covering the trail's expansion joints on the bridge. Some bike riders tell us the plates are jolting, especially for road bikes with skinny, highly inflated tires. I've ridden the trail myself, several times, and experienced the thump of each joint cover. I'm glad to report that we're working on a remedy. Our engineers developed and installed a prototype plate designed to ease the bumps cyclists experience while crossing the floating bridge. The new cover plate design won't completely eliminate the bumps – but it should produce a marked improvement. This is an improvement, upgrade all similar plates: text "A"
I didn't notice a difference/the old plates are fine: text "B"
We'll solicit feedback through the end of the year. If we hear that the plate provides a better ride, we'll manufacture and install replacements for all 27 existing narrow cover plates. The roadway on the new, 1.5-mile-long floating bridge has expansion joints on each end of the 23 massive, concrete pontoons supporting the structure. The joints allow the bridge to expand (or contract) horizontally as air and water temperatures change. They also allow the bridge to flex vertically as the lake's water level rises or falls. On the shared-use trail, there's an open gap at each joint that varies in width from about 2 to 4 inches. Left exposed, a gap of that size could be hazardous to someone with a cane, a skateboarder, or other trail users. So we added cover plates over each joint to address the safety risk that open gaps would pose. The trail's existing steel cover plates are a half-inch thick, with a flat top, beveled edges and a rough, nonskid surface. When designing the bridge, we used federal guidelines to ensure the plates' compliance with the Americans with Disabilities Act. The plates also play a role in the integrity of the bridge itself. The roadway and shared-use path are elevated 20 feet or more above the lake's surface. This design feature keeps vehicles, bike riders and pedestrians wave-free during windstorms. It also gives our crews ample room for inspection and maintenance of the pontoons below. 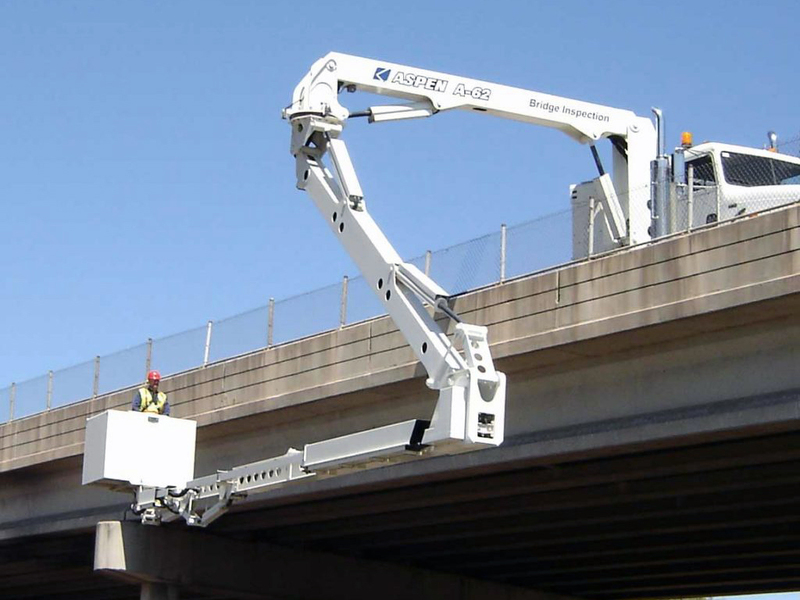 Because the bridge deck is elevated – up to 70 feet on the east high-rise near Medina – we use a special truck, equipped with an extendable, hinged arm and crew basket, for inspecting the underside of the bridge. This 3-ton vehicle travels along the trail for these inspections, so the cover plates must be strong enough to support its weight. Moreover, emergency vehicles, including fire trucks, might have to use the trail if a major incident blocked the roadway. A few bicyclists have asked us why the older, narrower shared-use trail on the I-90 floating bridge is smoother than the new SR 520 Trail – without the expansion-joint bumps. The answer, once again, relates to SR 520's elevated roadway. In the same way traffic moved on the old SR 520 floating bridge, all I-90 traffic crossing Lake Washington – including bicycles – travels directly on the pontoons' concrete surface. That means there are no heavy trucks making under-bridge inspections from I-90's shared-use path – and no need for sturdy cover plates on that path's expansion joints. The new SR 520 Trail is a wonderful addition to the region's expanding network of trails, and we want your experience of riding the trail to be fabulous as well. Be sure to #RateThePlate after your next ride! On Friday night, Jan. 11 2019, State Route 99/Alaskan Way Viaduct in downtown Seattle will close for good. That will mark the beginning of roughly three weeks of intensive construction work to move the roadway into the new SR 99 tunnel. We know, this is going to be rough. This will be the longest highway closure the Puget Sound region has ever experienced. More than 90,000 vehicles travel the viaduct each day and history shows that congestion worsens considerably during a viaduct closure – no matter what roads you travel on near Seattle. That’s why planning ahead is so important. Reducing trips during the closure will help everyone. Any adjustments you can make – whether it’s trying a mode of transportation other than driving, trying to form a carpool, teleworking or canceling non-necessary trips – will make a difference. We understand this isn’t a possibility for everyone all the time, but every little bit helps. While we can’t predict exactly what traffic will look like during the closure, history does give us some insight into what we might expect. Let’s use 2016 as a guide. From April 29 to May 8 of that year, SR 99/Alaskan Way Viaduct closed as the tunneling machine Bertha crossed underneath into downtown Seattle. We know many commuters heeded the call to change their commutes. For instance, the King County Water Taxi to and from West Seattle saw a 130 percent jump in riders. But we also know that commutes were rougher on all highways near Seattle. They started earlier, and they lasted longer. The same was true for Seattle city streets. The graphs below show some of the data and you can see more from that closure on our webpage (pdf 2 mb). The bottom line? If you plan on traveling anywhere near Seattle during the three week closure, consider changing how you get around (pdf 649 kb). If you can, work from home, try bus, light rail or Sounder trains, take the Water Taxi, share a ride, walk or bike if it’s available to you. If you can change your routine even for as little as one day a week, it will lessen the strain on your neighbors and on yourself. ‘Tis the time of year when holiday lights go up, Mariah Carey lets us know what she wants for Christmas, and snow falls on our mountain passes. And while snow can make for a beautiful sight, it can also make for challenging driving conditions. That’s right, it’s time to break out your tire chains! Unfortunately, many drivers crossing snowy mountain passes either don’t carry chains despite it being required by law, or don’t put them on. For the past several years, more than half of the closures on I-90 Snoqualmie Pass have been due to vehicles ignoring a chain-up requirement and then getting into collisions and blocking lanes. Chaining up when required on Snoqualmie Pass is vital for everyone’s safety, and failing to do so can result in a hefty fine. This winter we are working with the Washington State Patrol, which will be enforcing chain requirements during winter storms and inclement weather on Snoqualmie Pass. If you don’t chain-up, you will have to pay up. Ignoring the chain requirements could cost you $500. It’s a stiff penalty, but this is really important. When collisions block lanes on the pass, we have to close the roadway in order to get emergency personnel and tow trucks to the scene. This is much more challenging to do on a mountain pass highway than on a regular highway, and it can take hours. Not only does it take a long time, but it’s a huge inconvenience to the more than 30,000 vehicles that travel across Snoqualmie Pass every day. Vehicles weighing 10,000 pounds or greater – including some large SUVs and RVs – must install chains when traction tires are required. All vehicles, except 4WD and AWD, must put on chains when tire chains are required. However, 4WD and AWD vehicles still need to carry chains in order to proceed across the pass. All vehicles including 4WD and AWD need to put on chains when chains are required on ALL vehicles. What if your car has smaller wheel wells and can’t take chains? Or the manufacturer doesn’t recommend chains? Well, you are in luck. The State Patrol has compiled a list of approved alternatives you will need to use in place of chains. Not every “tire sock” chain alternative is approved as meeting our state standards, so check the WSP list before you make a purchase. Download the WSDOT mobile app. Follow our regional and pass accounts on Twitter, the agency's Facebook site and online travel alerts. Sign up for email and/or text updates about road conditions – including Snoqualmie Pass delay text alerts. 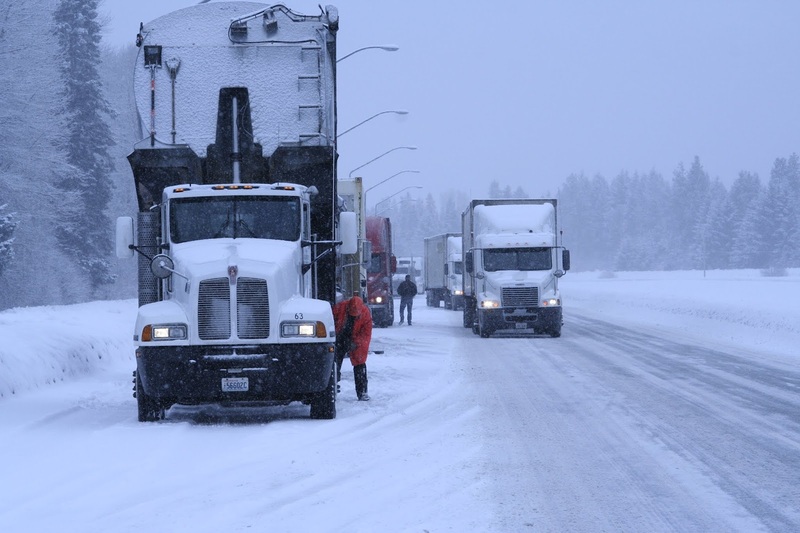 Check current traction and chain requirements for mountain passes, which are also available on highway-advisory signs and highway-advisory radio and by calling 511. Preset your radio to 530 AM and 1610 AM for our traffic information stations. So remember if you’re heading over Snoqualmie Pass this winter, make sure you and your vehicle are prepared to travel in the ice and snow and you understand and follow the chain requirements. Most of the time, our Life Ring Awards are reserved for our ferries employees whose actions saved a life. But in the case of U.S. Navy Petty Officer 2nd Class Nicholas Besheer and Vigor Safety Manager Billy Ray Brittain, it was clear they needed to be honored. 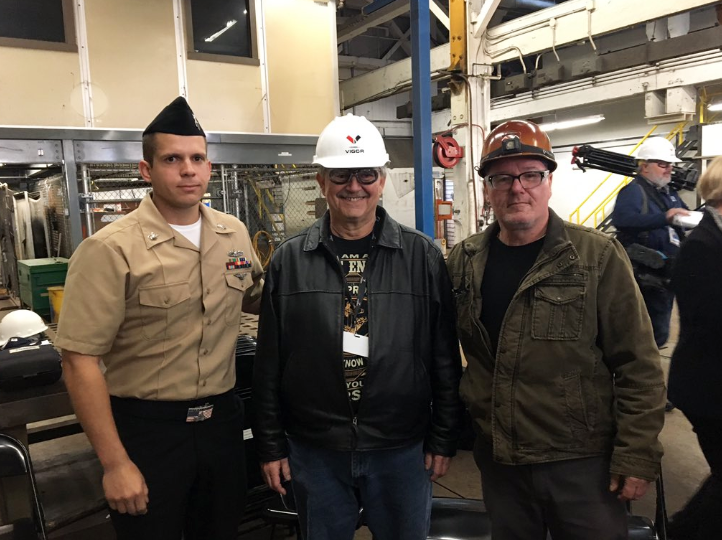 On Wednesday, Besheer and Brittain were presented with the Life Ring Award for their actions in saving the life of Dave Bennett, an Assistant Engineer aboard our ferry Puyallup, which was in dry dock at the Vigor shipyard in West Seattle. It was just the second time someone from outside of our ferries group have earned the award. 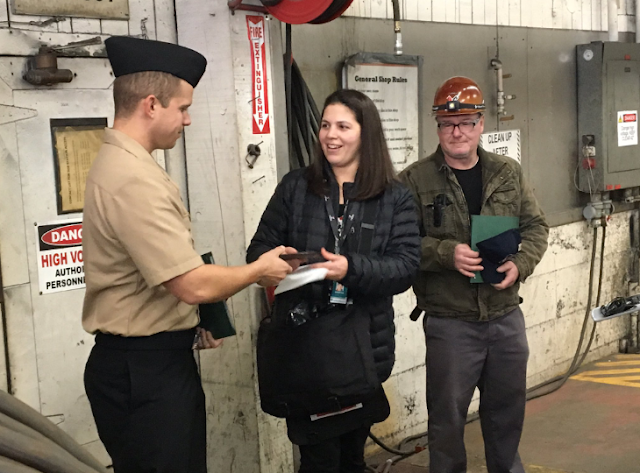 Washington State Ferries Chief of Staff Elizabeth Kosa presents U.S. Navy Petty Officer 2nd Class Nicholas Besheer (left) and Vigor Safety Manager Billy Ray Brittain (right) with Life Ring Awards Wednesday. "Without action and raw human compassion to save a life, we would not be here today," Washington State Ferries Chief of Staff Elizabeth Kosa said in presenting the award. "I'm grateful for every person and medical team that provided the best care available to ensure one of our own crew had a chance to recover from a significant medial incident." On Nov. 13, Bennett collapsed while working at Vigor. Besheer, who is assigned to the USS Sampson – which was also docked at Vigor – and Brittain performed CPR and used an automated external defibrillator (AED) on Bennett, who was suffering from a cardiac arrest. Their actions helped save Bennett until emergency medical help arrived. in saving Bennett’s life when he went into cardiac arrest in November. "Thank you for saving the life of one of our family members," Kosa said. "Thank you for making safety a priority, thank you for taking your training seriously, thank you for not hesitating and thank you for being an example to others." All of our ferries crew members, including Brittain, are trained in basic first aid. Licensed deck officers are required to take an advanced first aid refresher course every two years. All of our vessels are equipped with multiple AEDs and checked daily. This year, our crewmembers have responded to 88 emergency, life-saving or rescue events so far. Why does project cost estimating seem so hard? If you've ever taken on a major home remodeling project, you know that one of the first steps is to get estimates for what your project will cost. 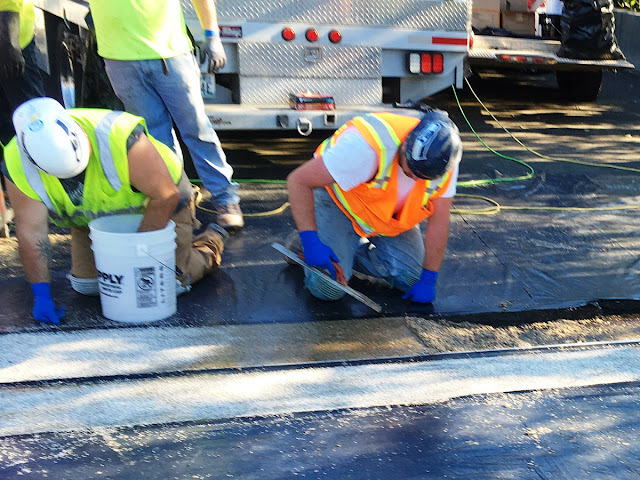 "Remodeling" a highway is similar in some ways, but for our projects, we develop our own cost estimate before we ask contractors to give us their bid for the work. What is an estimate, really? It's an educated guess using the best information we have available to us at the time. Like a home remodel, what we think the project will cost doesn't always align with what contractors bid for doing the work. We develop our estimates by looking at historical bids for similar work, as well as trends in material and labor costs and market conditions. It gives us a good basis to start from, but by looking back at the past, we aren't always able to keep up in volatile markets with rapidly rising costs or with unanticipated events, such as tariffs or work stoppages. With these kinds of variables, we consider contractor bids that are within 10 percent above or below our engineer's estimate acceptable and we typically award the project to the lowest bidder within that range. So for example, the Interstate 5 Northbound - S. 260th Street to Duwamish River Bridge project, which replaced concrete and expansion joints on I-5 in King County, was estimated to cost $29.5 million and the contractor's bid was $30.8 million. That's just 4 percent over estimate - yet it equates to $1.28 million. We recognize that this is still a lot of money. Contract Restrictions: Think about the differences in approach you'd take remodeling an empty building versus one that is occupied. We do the same for transportation projects. For us "occupied" might mean working around traffic on a busy roadway, or fish in a stream, or birds nesting on bridges and nearby trees - any of these might result in placing restrictions on when a contractor can do their work. The more restrictions there are, the less flexibility a contractor has to do the work, and often that is reflected in bid prices. Time of year: Projects advertised for contractor bids early in the season (December/January) typically result in lower bid prices. During this time, contractors are just starting to schedule work for the upcoming construction season, and supplies and available work force are more plentiful. Later in the season, there is more demand for labor and materials (such as asphalt) and those prices go up. For many of our engineers, the winter season is when they are developing projects - after the summer construction season is over - so it's a matter of balancing workloads, making it difficult to meet that early season time frame. Competition among owners: There's a construction boom happening in our state and when many project owners - for example, King County, City of Seattle, Sound Transit - all have projects within the same region, competition for construction contractors can drive prices up due to demand for available labor. A similar boom is occurring in the private sector as well. With so much work going on, we're getting fewer bidders on our projects because contractors are already busy. Contractors with more work than workers, might need to bring in extra crews from other regions, which drives up their costs (travel, lodging, etc.) and those costs get passed on to us. Project complexity: We have several unique and complex projects that require specialized engineering skills or construction expertise - including the largest bored tunnel in North American, ferry terminal projects that require both building and marine construction expertise, and floating concrete bridges - that create estimating challenges for engineers with limited exposure and experience in these types of projects. Project duration: Very large projects that span multiple years to build, might be subject to changing market conditions throughout the construction period. As a result, contractors may adjust their bids to reflect the risk and anticipated inflation. Materials costs: We track materials price changes for items that are commonly used in our projects, such as hot mix asphalt (influenced by oil prices) and steel (rebar and structural steel). We also monitor the effects of tariffs on commodity prices. In volatile markets, it's not unusual for us to underestimate these commodities because the historical bid information we use lags the market. Our engineers are trained professionals and they expertly design some effective and creative project solutions under challenging conditions. The chart below shows the percentage of projects that were below, within 10 percent, or above the engineer's estimate for the past three fiscal years (July 1 - June 30). 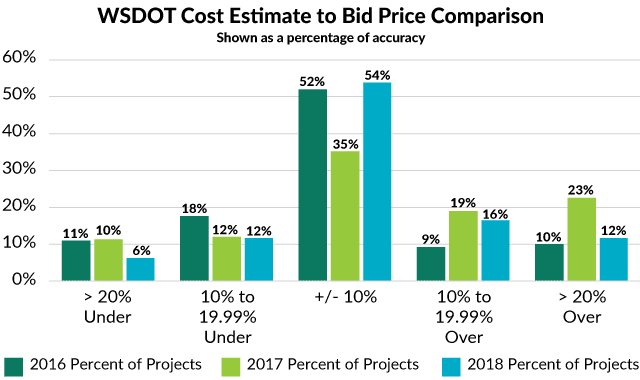 Nationally, the Federal Highway Administration sets the target for project engineer estimates within the plus or minus 10 percent range at 50 percent. We met that target in FY 2016, struggled with our accuracy in FY 2017 (for some of the reasons outlined above) and then bounced back in FY 2018. Like a home remodel project, in transportation construction you never really know what lies hidden until you start digging below the surface. It's similar to tearing the shingles off your roof and finding the plywood is rotten below. Although some things are beyond our control, we'll continue delivering the best results we can, using all the tools that are available to us.